The Atlanta Falcons defeated the Green Bay Packers on Sunday Night Football in Week 2, 34-23. Here are all the highlights, the recap and the final score. The Atlanta Falcons played the first game that counted at brand-new Mercedes-Benz Stadium on Sunday Night Football in Week 2. They came in and played a fast and physical brand of football. 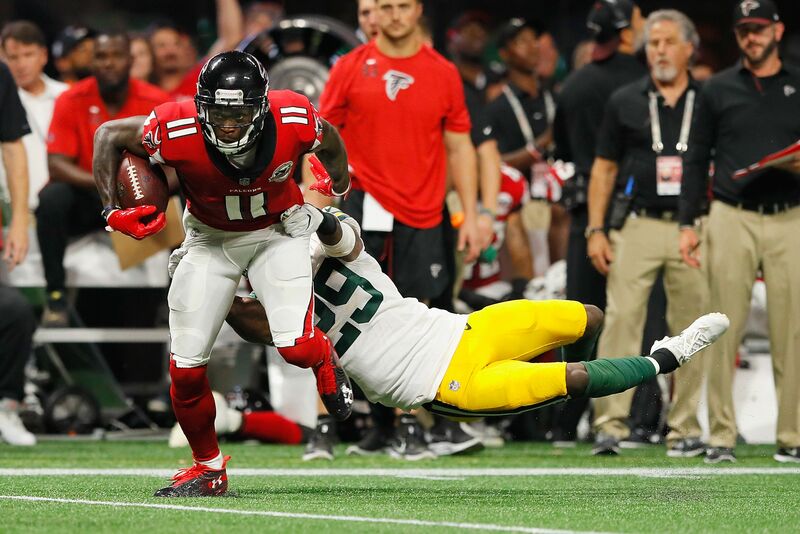 Atlanta pushed around Aaron Rodgers and the Green Bay Packers all night, as the Falcons improve to 2-0 with a 34-23 win. The Falcons’ pass rush and tight coverage in the secondary was too much for Rodgers to get into rhythm. He complete slick touchdown pass to Davante Adams, but it was too little, too late. Atlanta pounded the rock with conviction throughout the ball game. Devonta Freeman had a pair of rushing touchdowns on the evening. Tevin Coleman would get into the end zone as well. Where the game really went into Atlanta’s favor was on a pair of awful turnovers by Rodgers. He would throw a pick to cornerback Desmond Trufant late in the first half. Coleman would punch that next possession in for a touchdown to go up 24-7 at the half. Then it got really strange at the start of the third quarter. Rodgers would be sacked by defensive end Vic Beasley and fumble the football in the process. Trufant would pick up the loose ball for a quick scoop and score to make it 31-10 Falcons. Rodgers would take on a pair of touchdowns. Matt Bryant would make a field goal as well. Simply put, the Falcons put up a ton of points early and was able to outdistance a frustrated Packers team to get to 2-0 on the year. Devonta Freeman: Freeman had 19 carries for 84 yards and two touchdowns. He would also have two receptions for 16 yards. Desmond Trufant: Trufant had two tackles, two solo, an interception and a fumble recovery for a touchdown. Julio Jones: Jones had five catches for 108 yards. The Packers will host the Cincinnati Bengals on Sunday afternoon in Week 3. Kickoff from Lambeau Field in Green Bay will be at 4:25 p.m. ET. FOX will have the broadcast on September 24. Atlanta will play the Detroit Lions on the road in Week 3. Kickoff from Ford Field in Detroit will be at 1:00 p.m. ET on Sunday. FOX will have the September 24 broadcast.